The arrival of fall signifies so many different things, and depending on where you live, how much work you have to do before winter arrives. However, it’s always been my favorite time of year whether I was living in the Deep South or New England. No matter where you live, the change in nature is evident and beautiful. I love the change in light, the foliage, the crisp morning air and seeing the change in wildlife behavior. 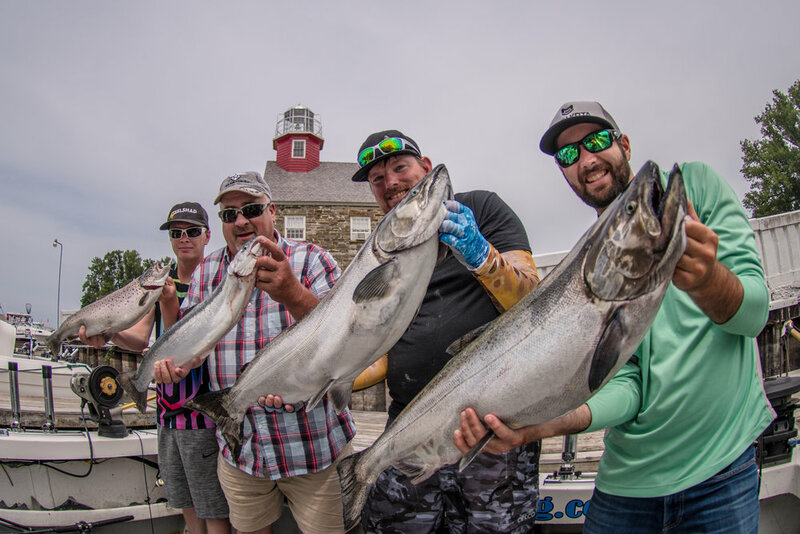 Fishing is at its best, with most all species feeding heavy in preparation for the winter months and the fall salmon run is a well-known ritual in many parts of the country. Even if you’re not close to a river where this natural phenomenon occurs, there’s still landlocked salmon and other salmonids to be caught, cooked and enjoyed. Not only are there several different species and numerous ways to catch the various members of the salmon family, salmon is also one of the healthiest foods you can put on your table. They are loaded with protein, rich in Omega 3 Fatty Acids and loaded with B vitamins. Other possible benefits include reducing the risk of heart disease, helping with weight control, fighting inflammation and new studies are showing that it can improve brain health. I would have to say an all-around superstar of a fish……..a true fighter that’s versatile in the kitchen, delicious on the plate and healthy. Another star player in the fall months is the iconic pumpkin. Seriously…...what would Halloween be without the pumpkin? While the pumpkin and its alter-ego, the Jack O Lantern, does a great job of playing the symbol of Halloween, it also does a stand-up job in and around the kitchen. Pumpkins are a winter squash, but to me at least, other than pie, it seems they get less play in recipes than some of its cousins like the Butternut, Acorn, Delicata or Hubbard squash. I’m not a fan, at all, of any “pumpkin flavored” items but real pumpkin, especially roasted, has both a sweet and savory flavor that lends itself to everything from soups to pies to pasta to breads. Pumpkins are another super food. They are packed with beta-carotene which may help reduce heart disease as well as certain types of cancer. They are also a great source of fiber and full of vitamins and nutrients. Salmon and Pumpkins are wonderful together anytime of year but freshly caught salmon and pumpkins fresh off the vine really make the perfect combo for a wonderful fall dinner. 2 cups of your favorite greens, I prefer baby spinach and arugula but kale, chard or any lettuce will work. However, if using greens such as chard or kale it's best to saute them a little first. For the salmon, prepare a charcoal grill or preheat gas grill. Lightly brush the grill grate with olive oil. Season the fillets with salt and pepper and place them skin side down on the grill. Cook for about four minutes then use a spatula to gently flip the filets over and cook for another few minutes or until the salmon flakes easily with a fork. For the risotto, in large sauté pan or Dutch oven, heat butter over medium heat until melted and hot. Add the onions and garlic and cook until the onions just start to soften. Splash sherry over vegetables and let simmer for 2 minutes. Add rice, stirring to coat with liquid, and let cook until liquid is absorbed. Reduce heat to medium-low Add broth, 1/2 cup at a time and cook, stirring often, until all of the broth is absorbed before adding more. (Add just enough of the broth to make rice firm but cooked through to center.) When about half of the broth has been used add about one-third of the pumpkins and continue slowly adding the broth and pumpkin until all the broth and pumpkin have been used and the rice is nice and tender about 20 minutes. Add the greens and cook while stirring for 3 or 4 minutes. Stir in the cheese and parsley and season with the salt and pepper. Plate the salmon and risotto, garnish with a little extra cheese and enjoy.